Christine M. Marozas, D.O. received her Doctor of Osteopathic Medicine from the University of Health Science College of Osteopathic Medicine, Kansas City, Mo. in May of 1995. She completed her internship at Park Lane Medical Center, Kansas City, Mo. in June 1996. 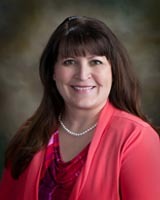 Dr. Marozas completed her residency in Family Practice at the University of Kansas Medical Center-Olathe Track in June 1999. Dr. Marozas joined the staff of Beloit Medical Center, P.A. in 2001. She is board certified in Family Practice by the American Board of Family Practice. She is a member of the Kansas Medical Society, American Medical Association, American Academy of Family Physicians, American College of Osteopathic Family Practitioners and the American Osteopathic Association. Her special interests include obstetrics and pediatrics. Dr. Marozas and her husband, Kevin have three children: Olivia, Noah and Grace. 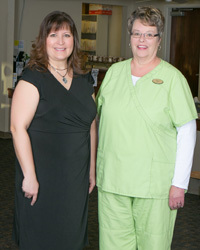 Dr. Marozas and her nurse, Mary Williamson. Dr. Marozas is available to see patients Monday thru Friday by appointment.